1)This is motorized machine having automatic loading/unloading cycle suitable for production testing. 2)The machine body is having a taper front look and a large size read-out in the front. The machine is powder coated for better look. The paint shade do not fade and machine looks like new over year. 3)The elevating screw of machine is guided in a hardened and ground bush, not allowing movement of elevating screw more than 0.05 mm when raised to full height. The accessory is retained for years together due to hardened bush. 4)A hardened and ground stepped bush is fixed on top of main screw for location and rest surface. 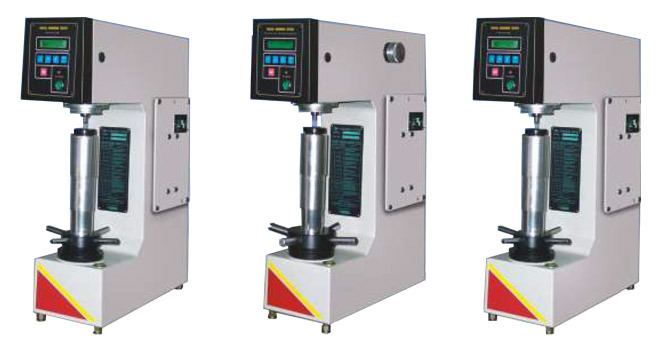 This guarantees no change in results due to rough handling of test table or test piece. It means a trouble free long life machine accuracy. 5)An antifriction linear bearing with almost no clearance is provided for a perfect vertical movement of loading plunger with minimum friction. This enables testing of small dia. Pin or ball upto 3 mm dia. 6)These models are provided with automatic working cycle and digital LCD display with 0.1 Rockwell resolution. This insures productivity with better accuracy. 7)IS:1586:2000 for Rockwell and superficial test. 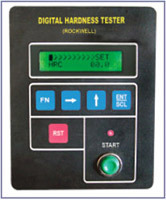 IS:2281:2005 for Brinell Hardness Test.